Hotel JL No 76, Amsterdam. JL No 76 Hotel Amsterdam. 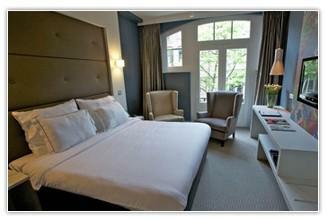 A hôtellerie jewel waits for you in Amsterdam city centre: Hotel JL No76. It’s located just few steps far from Vondelpark as well as museums and fashion district, so it is the perfect solution for a holiday in the capital city. Hotel provides 39 modern and designed rooms for its guests: to relax they can have a drink at the Honesty Bar or have a rest in the private internal garden; for a good dinner instead, JAN Eat & Drink restaurant is at their disposal. In Hotel JL No 76 rooms, customers can find COCO-MAT beds comfort after a long business day or city sightseeing, as well as all the technologies of an iPod dock station or the convenience of a DVD player.